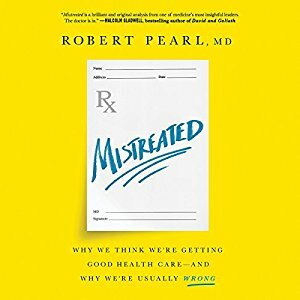 Among the millions of great nuggets I’ve picked up from Robert Pearl in his awesome work “Mistreated: Why we think we’re getting good health care and why we’re usually not” one was especially memorable and challenging. He shared a story about Lee Scott, former CEO of Walmart. Scott spoke at a conference and spent most of his time discussing bath towels. Crazy right??? That’s what intrigued me. Scott painted a vivid tale about the typical family that shops at Walmart each week. Middle-class, blue collar family with average income of $35,000 per year. By the time they’ve paid all the usual bills a set of bath towels is a significant purchase. Their world according to Scott is far different than the lives of the families that shop at Macy’s. If “Walmart families” can purchase two sets of bath towels for $20-$30 they’ll have enough money left in their budget to go out for pizza. But if those towels fall apart quickly that will really set this family back. He further described the arduous process of searching the world for quality products and fighting through bargaining on behalf of these families. Talk about knowing your customers. Talk about caring for your customers. Pure american hero right there. Am I right or am I right? Unless you talk to to leadership in the AFL-CIO that would classify Walmart’s treatment of it’s employees as horrific. In fact the treatment of their employees garnered tons of media attention and I’m sure the coverage didn’t escape you and Walmart was characterized as evil. Depending on your view point Lee Scott was either a hero or was evil. Well now I was really challenged. How did I feel? Which side did I lean on? Was Lee Scott and american hero because of his caring for shoppers or was he an evil villain for not caring about his own workers? The AFL-CIO stood up for the workers at Walmart as they have stood for the workers in so many other industries throughout the years. Electrical unions have fought for the conditions of their workers. The list goes on. So let me ask you this “Who is standing up for the clinicians who are burning out, facing depression and committing suicide at alarming rates?” The residents being worked like dogs and treated the same? The ICU nurses? Yes we need quality, affordable healthcare for those very same Walmart families. But is it fair to do it on the backs of the clinicians? If the conditions of the Walmart workers wasn’t acceptable and the world felt sorry for them where is all of the media attention screaming that the suicide and burnout rates for clinicians is out of control? Are their lives not as important as any others? I’ve previously talked about Janae Sharp and the work she does raising awareness of this very issue. She recently launched the SharpIndex.org with resources to help organizations monitor and track burnout and they provide resources to help physicians who recognize that they need help, anonymously. One of the resources that she provides is a survey. 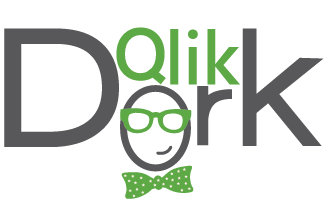 Qlik Healthcare has partnered with the Sharp Index to provide analytics regarding the data and support the cause. 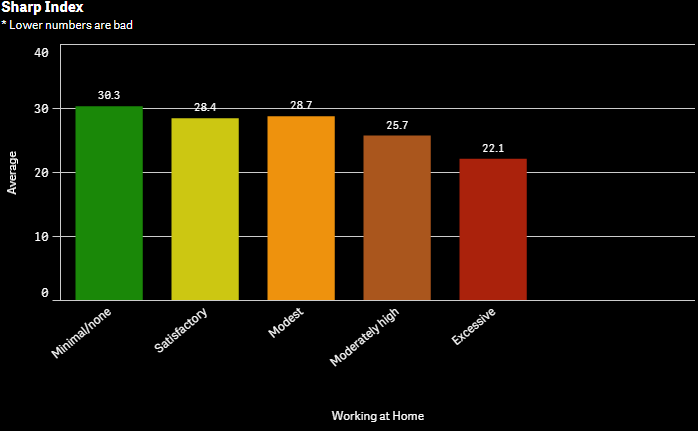 One of the most obvious insights based on the first 250 surveys was that the more physicians reported having to work at home, the worse their Sharp Index Score was based on the algorithms they use. Meaning the more burnout they were feeling. The “system” is rigged against clinicians. When you clock out and head home to unwind, they don’t have the luxury of actually clocking out. Their workflows cause them to take their work home with them in order to complete their mandatory tasks. Perhaps you are thinking “well it’s just a survey they probably just feel like they are working excessive hours.” Possibly. Possibly. However, Janae and I have worked with Baber Ghauri to analyze audit records of physician hours regarding hours when they enter documentation. The results were sad and validated the survey. There were many document types where up to 65% of the work was being done after the physicians ‘working’ hours. There is some good news on the horizon. I applaud the efforts of those across the country who are pushing towards a Quadruple Aim. Those that acknowledge that it’s hypocritical to talk about healthcare while ignoring the health of the very caregivers that provide the health-care. Caring is nice. But action is better. So they proposed what I thought was pretty unimaginable. They actually had the nerve to suggest that healthcare IT workers get out of their padded office chairs and walk on rounds with clinicians. The horror of it. Actually having to walk with physicians and watch them in action. I mean it’s not like they do this on a daily basis so how in the world would your schedule ever possibly line up to make that happen? Seriously it’s not like this topic is important enough that YOU need to take action. Is it? Many of you who are in the analytics space have probably written applications like our friends at Johns Hopkins to track which physicians have signed or haven’t signed their documentation. After all … nobody get’s paid if things aren’t signed. But what Etter Hoang did was add in … you’ll love this … the time documents were being signed so that they could proactively reach out to physicians to help with their workflows. Here’s the kicker … they’ve been doing this for years. They actually care about their clinicians not just the check marks. Getting other organizations to behave like John’s Hopkins and is the goal of the Quadruple Aim. Getting you to think about what you can personally do, since you are likely in IT/BI, and not allow clinicians to continue to be treated like Walmart’s workers is the goal of my post. This entry was posted in Population Health and tagged baber ghauri, janae sharp, mistreated, quadruple aim, rasu strestha, rober pearl, santosh mohan, sharp index. Bookmark the permalink. I’m a nerd; you’re a dork, which means we are from mutually incompatible species. We’re even more incompatible than dwarves and goblins from the world of Dungeons & Dragons (this is a joke that both nerds and dorks will love!!!) But net-net, I agree with you 100% on this post. My wife is a pediatrician, which is a fancy way of saying that’s she is a doctor for children from birth up through their 22nd birthday. Can you believe that? Pediatricians care for “children” as “old” as 21. So ultimately, pediatricians treat infants, toddlers, children and young adults (“young adults” being folks that can legally vote, fight in wars, drink in all 50 states, and buy marijuana in 9 states). Wow! But I digress… This evening, when my wife got home from work, I recommended this “From Walmart to Quadruple Aim” post to her. However, she does not have time to read the post! Because she is… entering… data… into her hospitals EHR (Electronic Health Records system). Help us please!!! Clearly we are from opposite sides of the street … but despite the media and politicians convincing us that we CAN’T possibly get along, I’m glad we are on the same side as this. So sorry to hear about your wife having to bring the work home with her. Use your nerdy hands to fix her a glass of wine and rub her feet I’m sure that’s what she needs. Once she’s done provide her the cliff notes version.